The Glacier Falls Summer Classic took place this past week at Anaheim Ice in Anaheim, Calif., with more than 100 entries competing in the final U.S. Figure Skating monitoring competition of the summer season. Skaters traveled from all over the country, as well as Italy, Japan, Israel, and the Philippines, to take advantage of feedback from national and international level judges and technical specialists. 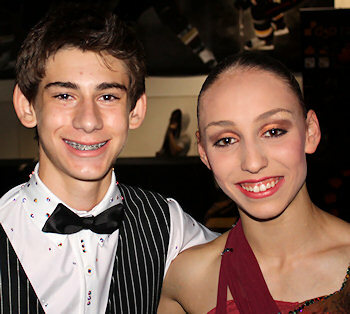 Golden Skate’s Elvin Walker attended the competition for two days, and caught up with several of the entries. Fifteen year-old Allison Timlen has been getting a lot of mileage on her programs this summer. Glacier Falls was her third competition in as many months—she competed in the Chesapeake Open in June and at Liberty in July. Timlin, from the Baltimore area, has only been jumping for about six weeks, putting her behind many of the others she has been competing against. During her recovery, Timlen used the time to work on her skating skills. In being so far behind in her jump training, Timlen and her family have not yet had a family vacation this summer. Timlen has taken to the feather in the hair trend that American Idol judge Steven Tyler made popular this year. This season, Courtney Hicks has added a few more weapons to her arsenal of already dangerous tricks. 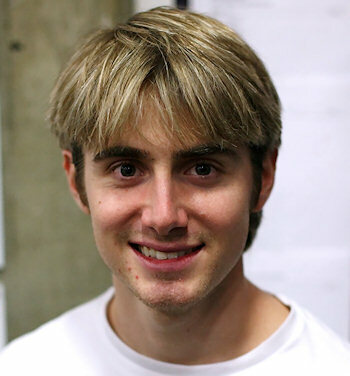 The risk of attempting the loop in the short program is one that Hicks is willing to take. On the presentation side, Hicks has been working with former World Champion Randy Gardiner to try to draw the audience in to her programs a bit more. Hicks will travel to Brisbane, Australia, for her first ever Junior Grand Prix event later this summer, and is looking forward to competing Down Under. Many Golden Skate readers have asked about Hicks’ heritage, and it will come as no surprise that the junior champion has Russia in her blood. After graduating from high school this spring, 18 year-old Caroline Zhang found herself with something that she doesn’t ever remember having—free time. 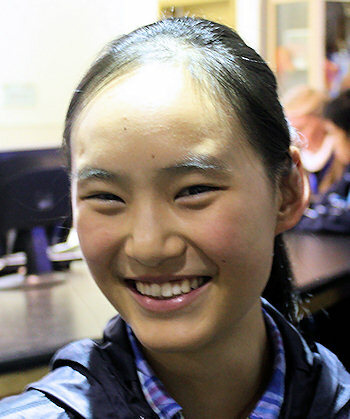 Zhang has decided to take a year away from school altogether to see what she can do in skating without academics nipping at her blades. 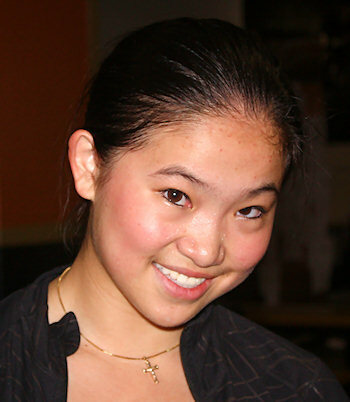 Zhang’s rededication to the sport was evident in Anaheim, as she skated with more attack than in recent competitions. Though the double Axel is still problematic for the two-time U.S. medalist, her other jumps look stronger. Presently Zhang is unsure of what her future holds, but she is keeping her options open. Like 2010 U.S. junior ladies champion Agnes Zawadzki, 16 year-old Gracie Gold hopes to emerge from the shadow of not qualifying for the national championships in one season to winning the junior title the next. That newfound confidence has translated in to one of the most buzzed about summer seasons in recent memory. Skating in three of the most high profile non-qualifying competitions (Liberty, Skate Detroit, and Glacier Falls), Gold has scored more than 150 points in each, and has hit huge jump such as her signature triple Lutz-triple toe loop combination. “The triple Lutz and triple toe loop are both of my favorite jumps, and the combination is pretty easy if I have a good Lutz landing,” she admitted. 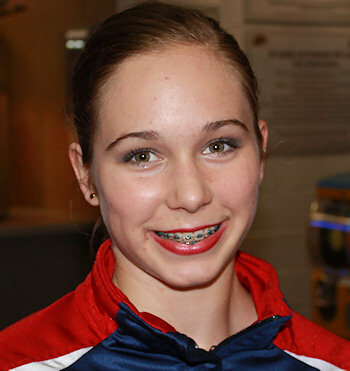 Gold has recently been added to the international selection pool of skaters, qualifying her for a possible international assignment this fall. Gold competes with her twin sister, Carly, who she admires for her better attitude and ability to recover from a mistake. Gold will be a high school junior this fall, and is looking forward to Halloween this year. San Diego’s Katarina Kulgeyko (pronounced Cool-gay-coh, not Katrina Gekko as she is quick to point out), skates to the beat of a different drum. From her black tights that have fins flowing from them to her sassy attitude, Kulgeyko is an original. “I want to be an individual, and I really do try to be different,” she admitted. “I like wearing different costumes, skating to different music, and standing out. Don’t get me wrong, if I needed to wear a very classical costume for my program, I would, but I just prefer to be unique. Kulgeyko’s parents are from Russia, she enlists the help of a Russian coach, and she speaks fluent Russian. The fifteen year-old did spend part of the summer in Russia training with two time Olympian Vladimir Kotin. Kulgeyko heads to Riga, Latvia, at the end of the month to skate in her first ever Junior Grand Prix event, and is looking forward to representing the United States. Kulgeyko and her coach decided to stick with the junior level domestically for another season to give her a chance to adjust to her new body. When not thinking about figure skating, Kulgeyko has a passion for nail polish. 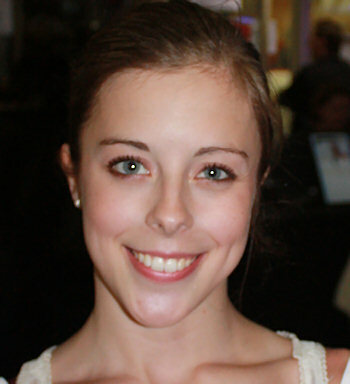 “I got the sense that it’s now or never,” Ashley Wagner said. So, the former World Team member decided that she needed to make some changes. A little more than two months ago, she picked up and moved across the country to train with John Nicks in California. Nicks and Mills completely deconstructed Wagner as a skater—pushing her off ice work outs further than she had ever taken them, and refining just about everything that she had ever done on the ice. Mills, who studied ballet at the American Ballet Theater, took Wagner to task with her Black Swan inspired free skate. Ever the perfectionist, Mills wouldn’t allow his pupil to slack on quality. The result is a much more refined skater who is much more pleasant to watch. Wagner is settling in to her life in southern California quite well and though she misses her friends and family, she is enjoying her new home. Though it has been almost three years since her last trip to the U.S. Championships, Karen Zhou is still plugging along. Zhou, 19, is a full time student at the University of California-Irvine, and will graduate with her class in the spring of 2012 with a degree in Business. She is currently balancing school, a summer internship, and her training. With her hectic schedule, Zhou has decided to take on the responsibilities of being her own coach as well. Zhou also takes ownership of her choreography. A few days before Glacier Falls, Zhou’s mother was dropping her off for practice when in a freak accident occurred. What happened next could is like a movie of the week. Luckily for Zhou, the rink is equipped with a gym that is utilized by the local firefighters. After a trip to the doctor, Zhou learned that there were no breaks in the foot or leg, just some cuts and bruises. 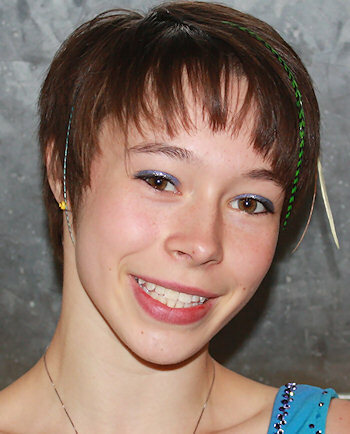 The very lucky skater needs just a five to seven day break before she is allowed to return to the ice. A quiet, shy type, 16 year-old Nix Phengsy goes about his business with little fanfare. It is on the ice when the high school junior comes to life. This season, fresh off of the novice level, Phengsy hopes to make a strong impression in his first year as a junior man. A member of the international selection pool, Phengsy has yet to be assigned to an international competition. Coach Alex Chang doesn’t seem concerned. One of the big things that Phengsy has had to learn this season was a camel change camel spin, something that he had never done before, but is a requirement on the junior level. While waiting for football season to start, Phengsy has spent the summer curled up with a few good books. After performing far below his own expectations at the U.S. Championships for several years, 22 year-old Douglas Razzano had the breakthrough that he had been searching for last year in Greensboro. Razzano says that his mindset about skating changed last season, and that has made all of the difference in the world as an athlete. In Anaheim, Razzano chose not to compete with his trademark quadruple toe loop, but instead focused on the performance aspect of his programs. 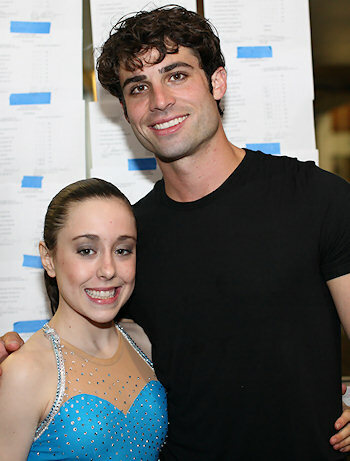 Even without the quad Razzano, won the competition in Anaheim with the second highest men’s score of the season. Back in May, Razzano, Adam Rippon, and former pairs skater Bianca Butler got together in Los Angeles for a little break from the daily grind. These days, when he’s not in the rink, Razzano can usually be found in the lake water skiing. “In Arizona, you try to stay as cool as possible,” he said. His goals this season are simple—to make the podium at the 2012 U.S. Figure Skating Championships. 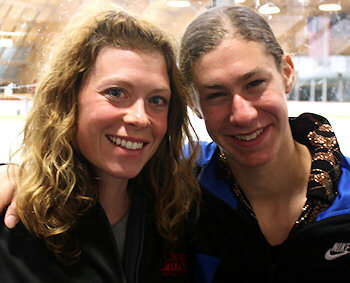 Since Golden Skate caught up with Jason Brown earlier this summer, he has solved his hair conundrum. “I read the survey on Golden Skate every day for a while, and I decided that I would keep my hair long,” he said with a laugh. With the hair debate behind him—at least for this season—Brown has been focusing on adapting to a new skate boot. Brown tried the triple Axel in the short program in Anaheim, receiving the dreaded <<, reducing scoring power of the element to a little more than one point. Like Hicks, Brown will have the rare opportunity to skate in Australia, as his Junior Grand Prix assignment will be to the event in Brisbane. Brown and coach Kori Ade were training at Lake Arrowhead leading up to this event, and he had the opportunity to train on the same ice as fellow Chicagoland native Evan Lysacek. What a difference a few short months can make—especially in terms of a very new partnership on the ice. 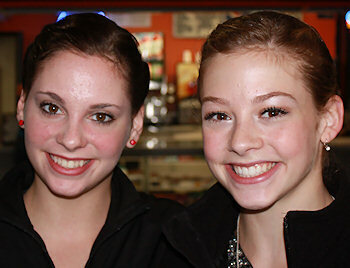 Mary Beth Marley and Rockne Brubaker have transformed themselves both on the ice and off. Marley has also made a physical transformation, appearing more mature as well as a bit more fit. “Pairs requires so much back and arm strength, and I’ve been working on getting stronger,” she said. “I’m not wobbling like I used to in lifts, so the work is definitely paying off. The physical changes, while remarkable, are nothing in comparison to the evolution of what has changed on ice. Gone is the athletic style that Marley and Brubaker depended on last season. This year, the team is longer, leaner, and very elegant. “We’ve taken lots and lots of ballet,” Marley said. There are noticeable improvements in speed and unison, and even though there was a mistake in their short program in Anaheim, the overall picture is much stronger than last season. Marley, who has decided to forgo competing in singles for at least this season, and is looking forward to the opportunities that she and Brubaker will have this season. Marley and Brubaker see this season as a foundation for what they hope to achieve next season. Marley has been spending her time this summer getting to know her surroundings. “I’m new to California, so I’ve been exploring a little bit,” she said. “I’ve really been enjoying the tons of arts festivals that have been taking place in southern California. It’s a nice relaxing way to get away from skating. Brubaker recently spent some time back in his native Chicago participating in Moosefest, the brainchild of former U.S. skaters Jimmie and David Santee. The event has a summer and winter version, and pits teams of figure skaters against each other in athletic competitions.